It’s a custom in Malaysia to have an “open house” during the Eid ul-Fitr holiday – basically you have a giant spread at home and people come over. For my family’s open house this year, my mum cooked some food for the family and everything else is catered. Breakfast of my mum’s nasi himpit, peanut sauce and chicken rendang. Damn right, it’s better than yours. Eid cookies, ready for guests. 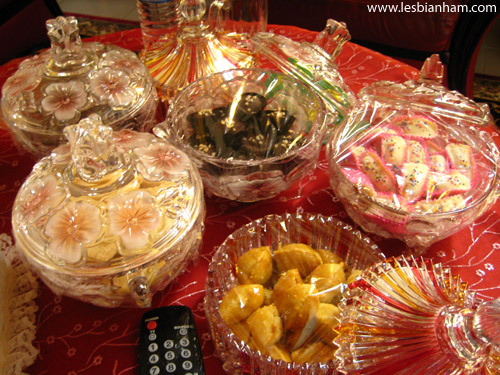 My favourite is the one in the bottom right – buttery pineapple tarts. Setting up the main food table. 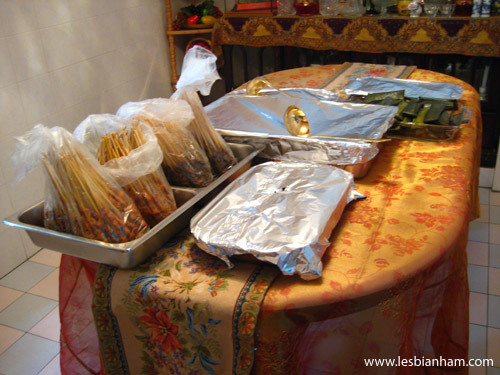 Notice the gazillion sticks of satay on the left. Friends swooping down on the food. 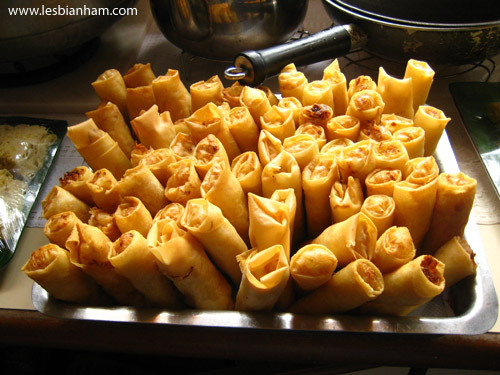 In this picture you can see chicken curry, roti jala, two types of achar (pickles) and the spring rolls. My plate. From bottom left, curry chicken, achar, chicken satay, glutinous rice in banana leaf, nasi himpit, spring roll and nasi minyak. hey, hope you are well.. i was searching for malaysian eid cookies and ended up here… love those yummy traditional eid cookies..Do you think you can help me order those eid cookies online. please I’ll appreciate ur help…betw Ramadan Kareem Mubarak!